TWENTY-eight-year-old Selina O’Leary upped sticks from her home in Tullow and travelled thousands of miles to Siberia to an area known as ‘the end of the world’. 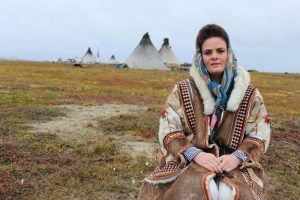 Plucky Selina spent two weeks in the far-flung Arctic Circle with a tribe of nomads called the Nenets for a new documentary series on RTÉ called the Traveller’s Guide, which aired last Wednesday. Selina was chosen to go to Siberia for the documentary, which looks at how nomadic tribes live around the world and the similarities that can be drawn with the Irish Traveller community. Her decision to go was a brave one, given that it’s one of the coldest, most desolate places on earth. “It was so cold that it got into your bones. I couldn’t get warm. I only brought jeans and tops with me because I didn’t realise. It was icy cold and the wind would sting your skin and eyes. But I was given a coat made from reindeer skins and a scarf so I was warm, but ended up looking like an old woman!” laughed Selina. The Nenet people constantly move camp, searching for fresh grazing for their reindeer. When Selina was there, she had to trek about 15 miles across wet, boggy, potentially dangerous terrain in the freezing cold as they migrated south for the winter months. At the end of their first trek, Selina was almost at the end of her tether … cold, wet, exhausted, hungry and homesick. Her decision to leave her family for two weeks was a huge one, particularly because she had to leave her four-year-old daughter Ann for the first time ever, as well as her parents Josie and Francie and her 11 siblings. “I really tried to keep a brave face for the camera, but I did cry. I needed my little girl; I needed to talk to her. I’d never left my little one for even an hour; I always keep her close, so that was very difficult. I felt very bad about that,” she added. That Selina was welcomed into the tribe was made clear by the fact that she was given her own sleigh to drive and by the warm hospitality she was shown. And even though the conditions were extreme and the journey was hard, Selina enjoyed the experience, singing to the reindeer and laughing with the Nenet people. “I knew that this was really, really special, and that no other Traveller girl could get to do this. It was so beautiful and peaceful, too. I’d love to go back in the wintertime when it’s -80 degrees. Can you imagine that?” she laughed.